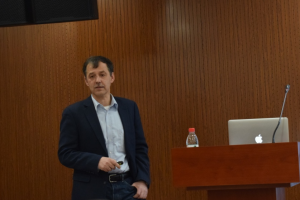 Prof. Evgenii V. Kondratenko visited us today and e gave an IRCE2 Lecture named Supported VOx-based and bulk ZrO2-based catalysts for alkane dehydrogenation: Active sites, design and performance. Prof. Evgenii V. Kondratenko (Rubtsovsk, Russia, 1967) graduated from the Novosibirsk State University in 1991 (diploma degree in chemistry with specialisation in chemical kinetics). He earned his PhD (Candidate of Chemical Sciences) in 1995 at the Institute of Chemistry of Natural Materials in Krasnoyarsk. In 1997, he was awarded a fellowship from the Alexander von Humboldt Foundation at the Institute for Applied Chemistry Berlin-Adlershof. After a Post-Doc stay at the same institute, he obtained a habilitation degree (the Venia Legendi degree) from the Technical University Berlin in 2007. His publication activities include 156 articles in peer-reviewed scientific journals, 7 book chapters and 12 patent applications. His research field is in heterogeneous catalytic transformations of small molecules: oxidative and non-oxidative functionalization of C1-C3 hydrocarbons, CO2 conversion into value- added products. A particular focus is put on the reaction mechanism and kinetics for establishing fundamental relationships for tailored catalyst design or optimized reactor operation.